I would like to take the time to sincerely comment on how very pleased my officers have been with your product, Phantom Handheld Radar unit. 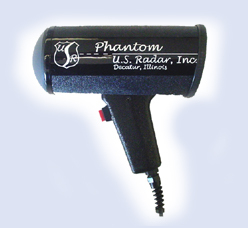 The Phantom radar gun has been dependable, simple to use and extremely effective in helping our officers enforce our speed limits while reducing our traffic accidents and keeping our community safe. If possible we would like for your company to consider our officers and our city in any testing for new products. Again, myself and our officers could not be happier with your product. It has proven to be an invaluable tool in our fight to keep our citizens safe from problem motorists. Also I would like to add that your customer service has been very courteous and helpful when called upon for routine maintenance. The Phantom Handheld stationary K-band speed radar is a professional police traffic radar with a low cost design! It is the smallest, lightest, DSP (digital signal processor) police speed radar on the market today as well as being one of the most economical. All government agencies are automatically accepted for financing through First Government Lease Co.
IACP Approved The International Association of Chiefs of Police testing includes NHTSA and D.O.T. approval. Durable Premium design promotes long life. Fast Action Pull the trigger and an accurate speed display appears instantly. No time for violator to reduce speed. Accurate The Phantom speed radar confirms speed to within +/- 1/10th MPH before it displays, no matter how weak or strong the signal. Long Range No other speed radar shoots farther and more accurately. Display 3 Bright easy to read LED's. 2 year warranty on all parts & labor for normal use, excluding cosmetic damage not affecting performance. All warranty is F.O.B. factory in Decatur, Illinois. 1 Certified tuning fork - 55 MPH or 90 KPH. KPH or MPH - Specify with order at no extra charge! U.S. Radar, Inc. is a woman owned and operated company.